A Dannhauser born in Lyon, who has already lived in Göteborg. A Brunner born in Vienna and saved from the Nazis through a Kindertransport to Great Britain. A descendant of Rabbi Kafka who was born in Benghazi in Libya, a Brunner descendant who was born in Milan and grew up in Malaga in Spain, a British born Bernheimer descendant who only recently learned about her Hohenems connection. 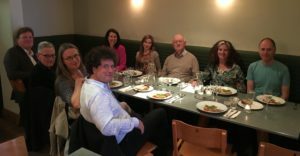 A violonist, a Catholic priest, an archivist of the British Library, a French language teacher, an artist, and a Rosenthal who is a curator at the London Jewish Museum and the only one at the table who was NOT a Hohenems descendant or spouse—that was the crowd meeting in the nice Market Restaurant on Parkway in Camden last Thursday. Meeting “Hohenemsers“ at the Market Restaurant in Camden. On the occasion of the London presentation of our exhibition “Jukebox. Jewkbox! A Century on Shellac and Vinyl!” we organized a little London pre-reunion of Hohenems descendants. After a tour through the exhibition, we enjoyed spending time together and I had the chance to give an update on the museum’s development and the preparations for the big event next year—when we expect descendants from all over the world for the third Hohenems Reunion, celebrating 400 years of Jewish presence in Hohenems and the Hohenems Diaspora. 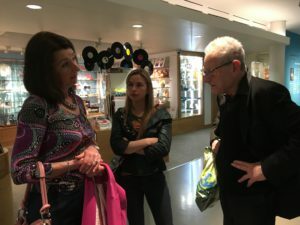 For some, meeting in London was an opportunity to reunite with more or less distant cousins having already seen in Hohenems and to exchange updates on family events, careers and life. For others, it was a first encounter with each other and with the Hohenems background of their families. It was also definitely an encounter with a dimension of 20th century popular culture that was unknown to most before our exhibition. Telling the history of the global music business and of pop music that connected the world with the invention of the gramophone and the record was a thrilling experience. It’s all about “identity” in the making. And as is common with this quest for identity, you end up with something round and nice, like a record of shellac or vinyl: with a long spiral trajectory and nothing but a hole in the middle—a blind spot, something that you must leave open as a question. Hohenemsers meeting in record heaven. But there is one thing we do know—and it’s a funny story itself. In some way, the history of pop music starts in Hohenems. How could this be? In 1826, a young cantor from Hohenems, Salomon Sulzer, was invited to become chief cantor of Vienna. Soon he became a star in this world capital of music of the time. He was the first Jewish musician that non-Jews listened to in great numbers. He ranked among the greatest composers of the time, along with Schubert and Liszt. He was among the first who set Jewish prayers in written, notated music that could be sung by professional choirs. His composition had a strong impact on his contemporaries. He composed and performed secular music with lyrics from Goethe to revolutionary songs. He was adored like a star by Jews and non-Jews alike. And he became the role model for many Jewish musicians who crossed the border between the synagogue and later Broadway and Tin Pan Alley, where Jewish musicians (especially the sons of cantors) became prominent and successful performers, composers and producers of popular music, shows and musicals after Sulzer’s time. They formed a line ending (preliminary) with punk bands like The Clash and singers like Amy Winehouse. The story, therefore, of how pop music started is a strange bit of chance, and it might even be pure legend. When Salomon Sulzer was a child, he fell into the Ems creek but was saved. His parents swore an oath that he would serve his community by becoming a singer in the synagogue. We’ll say “se non e vero e ben trovato”—even if if it is not true, it is a good story to tell. Getting together with a crowd from Hohenems in “Jukebox. Jewkbox!” in London—specifically in Camden town, the birth place of British pop, just a few blocks down from Camden Market where the Clash once rehearsed and where today a small monument commemorates Amy Winehouse—is a particularly nice spiral movement toward the riddle in the middle. I greatly enjoyed that. 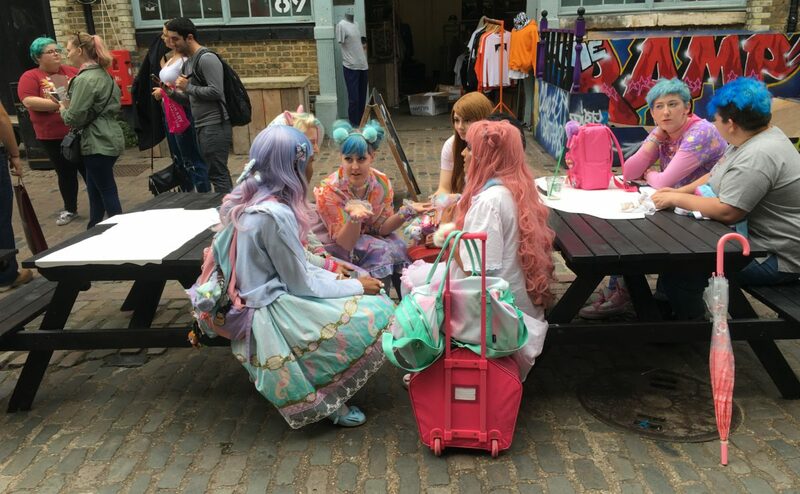 In the middle of weird times in London, it is still a joy to be in the city. At least there is no “Brexit” for Jewish Museums. 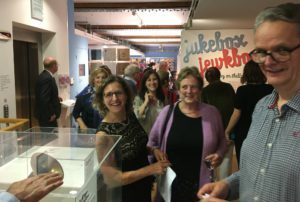 Our London colleagues invited our exhibit “Jukebox. Jewkbox! A Century on Shellac and Vinyl,” which opened yesterday at the beautiful Jewish Museum on Albert Street in Camden. 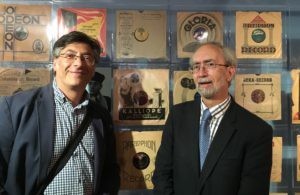 Alan Dein (left, London based collector, and historian, who contributed to the project so much from the first minute), together with David Leigh, a descendant of the Levy’s family, whose record shop introduced black Jazz music in Great Britain. The opening (which they called a “private view”) attracted hundreds of joyful guests. We didn’t exactly get privacy, but we did have many nice encounters, chats, and discussions. 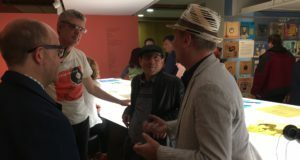 The crowd seemed like they could have stayed at the show forever, listening to the music samples and the intimate, poignant and thought-provoking stories told by some forty “witnesses” of the history of 20th-century global popular music from all over the world. Abigail Morris (center left), director of the Jewish Museum London, obviously having fun. These witnesses all came together digitally on the counter in the middle of our global record shop of “Jewish music.” (The eldest, a man from Warsaw who is now turning 101 years-old, told about his childhood memories of Jewish popular musicians and cantors in interwar Poland. The youngest spoke about her experiences with punk music and hip hop). Visitors explored the 20th century through the contributions of Jewish inventors, musicians, composers and business people to what became the first global culture: the gramophones and the records. 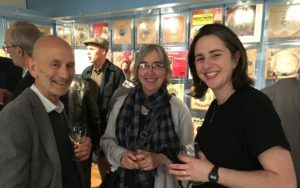 Joanne Rosenthal (curator of the Jewish Museum London, on the right) with Antony Lerman (left) and his wife Kathy. Since the museum had asked me to say a few words at the opening, I took the liberty to question some of the myths about “Jewish music.” The history of popular music was definitely influenced by the rebellion of Jewish cantors and their children, Yiddish theatre stars and comedians against their traditions and the expectations of their peers—much more than by any continuity of Jewish culture. But maybe this rebellion against tradition, this ongoing struggle for reinvention is also continuity? 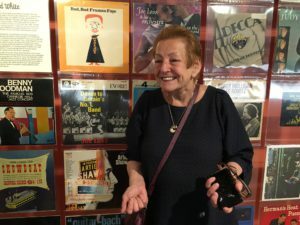 Jennifer Jankel from the Jewish Music Institute, daughter of British dance music legend Joe Loss, in front of records of her father. 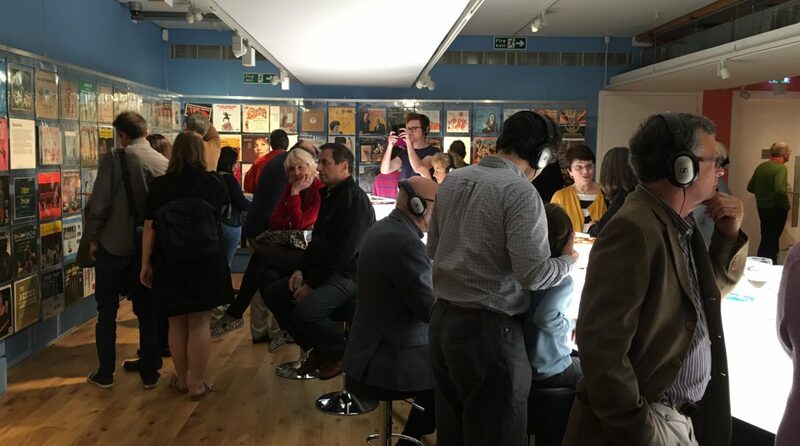 Regardless, our show was a perfect stage for the crowd in the Jewish Museum London to bustle around, to share their own memories of moments where listening to a record could change their lives or perhaps the world, and to discuss the future of their country. Guests discussing memories of pop culture or the future of their country. The same day our exhibit opened, the British got a new Prime Minister, jumping out of the box, who is able to say “Brexit means Brexit,” without having any idea what “Brexit” could mean. But maybe that is the secret of this tautology. “Brexit means Brexit means Brexit”—which is: it means nothing but a mess, without making sense to anybody. Be sure. We will get more of this in the future. Last weekend, I traveled to the Diaspora of Hohenems exhibitions. 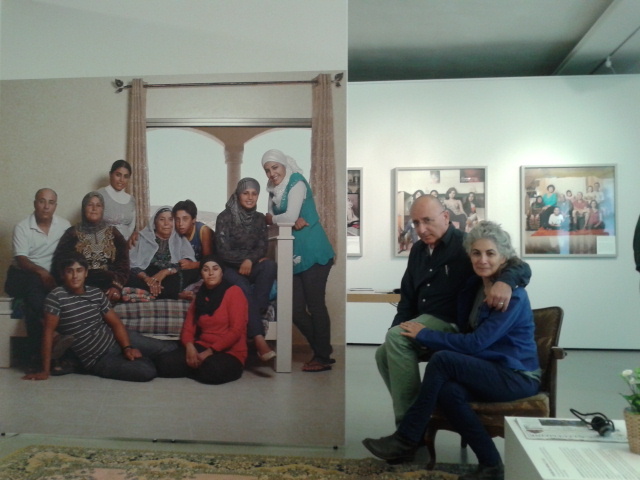 “Family Affair,” our show about the diversity of Israeli families, including the whole range of Jewish immigrants, Muslim and Christian Arabs and foreign workers—all those who form this fragmented society, is now being shown at the concentration camp memorial of Flossenbürg. A weird location one would say. Reli and Avner Avrahami, the artists, and Avraham Burg, the former speaker of the Israeli Knesset, came from Tel Aviv and Jerusalem for the opening. Burg expressed his puzzled feelings about his own presence on this site. He does not like the shoah business, the attempt to make the suffering and the annihilation of masses a subject of education and representation, esthetics and political interests. Avraham Burg, former speaker of the Israeli Knesset, outside the Floss Jewish cemetery. 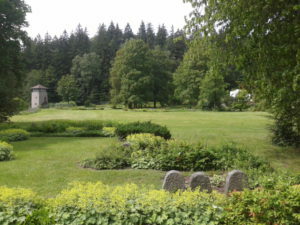 But the Flossenbürg camp, once situated in the woods next to a village and a castle at the German-Czech border (and to a quarry the prisoners were forced to exploit) now offers all these contradictions as a starting point for a discourse about the present and the future. Even the history of the camp site after 1945 is discussed at length: the puzzling effect of turning such a site into a beautiful cemetery (already in 1947 by survivors and Polish DPs), a new suburbian housing project for German refugees from the East (in 1958), a park (administered by the Bavarian office for the preservation), a modern education center (since the 1990s), and even a “museum’s cafe” (in the old SS casino, now run by a integration project for young people with special needs). 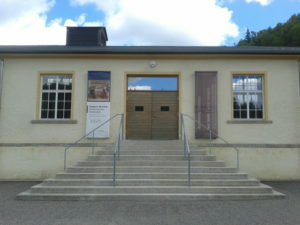 The former prisoners’ kitchen at Flossenbürg. Today, it’s an exhibition space. 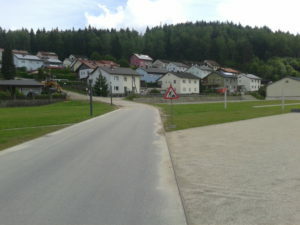 A view of the neighborhood built in 1958 on the former camp grounds. 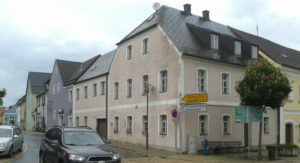 The former prisoners’ kitchen is on the right. Symbolic tombs of prisoners on the camp grounds. For me and my wife, meeting our friends Reli, Avner and Avrum was a family affair in a disturbing setting, but also a heartfelt one. We did not present our reality of societies formed by intercultural exchange, migration, and the competition for legitimate identities, resources and power at such a place before. And that makes this playful exhibition, the family portraits and fragmented stories told by average people from all “tribes” all the more meaningful. But this trip to the North-East end of Bavaria—the region is called Oberpfalz (Upper Palatinum)—was a family affair for me in a more profound way. The earliest Loewys in my family lived in two small villages on the Bohemian side of the border, Dlouhy Ujezd and Porejov. I found it difficult to pronounce these names when I was speaking to the audience that came to the opening in Flossenbürg… One of these villages—Porejov—was wiped out after the war, when American tanks liberated the area, and a year later the “German” villagers were forced to leave by the Czechs and became refugees in Western Germany. 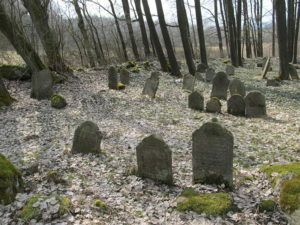 There is not much left of Porejov, but a ruined church and the Jewish cemetery, situated a few hundred meters away in the forests. 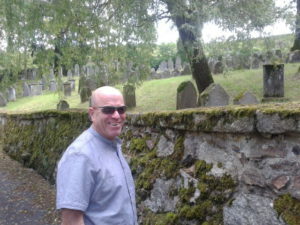 The Jewish cemetery near Porejov. 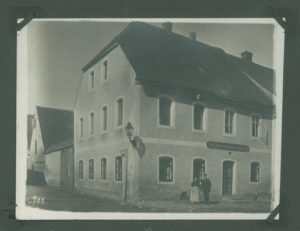 My ancestors in these villages were in cattle trade, and one of them, my great-grandfather made it to the “West,” which for him meant ten kilometers into the Oberpfalz, to Waidhaus, where he lived in a nice house that is still standing on main street. There, he did not sell only cattle anymore, but also the equipment for butchers. My great-grandmother Julie and my young grandfather Richard in front of their house, taken in 1908. Today, my greatmother and my young grandfather no longer stand in front of the house, but there is a signpost directing tourists to the memorial of Flossenbürg. A sign outside of my grandparent’s old house points to the Flossenbürg memorial. I had been here once previously, 36 years ago, with my father on memory lane, or better on the traces of memories we both never had. What struck me most when I went there with my father was the World War I memorial in the center of Waidhaus. With my “father” inscribed in the list of German patriots who gave their life for the Fatherland. 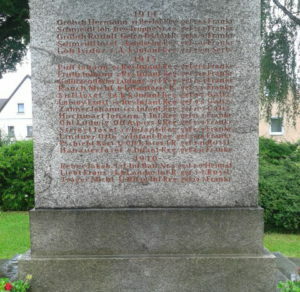 A World War I memorial lists my great uncle among the German soldiers who died fighting. I think I will not wait another 36 years to visit this landscape of unfamiliar memories again. After all, it is a family affair of sorts.